Purchase She is Yours and Strong Fathers, Strong Daughters together at a special savings and receive free the Lifting My Children through Prayer card. Now comes the hard part—raising her up from a baby to a happy, healthy adult—and remembering that everything you have is God’s, including your daughter. Wynter and Jonathan Pitts want you to know you are not alone. The proud parents of four young daughters, they’ve gained a wealth of valuable insights on the unique challenge of raising girls. They’ve been right where you are and now they want to share what they’ve learned with you. Start this journey by making this commitment to God: Lord, she is Yours and I trust You with her. In today's increasingly complicated world, it's often difficult for parents to connect with their daughters–and especially so for fathers. 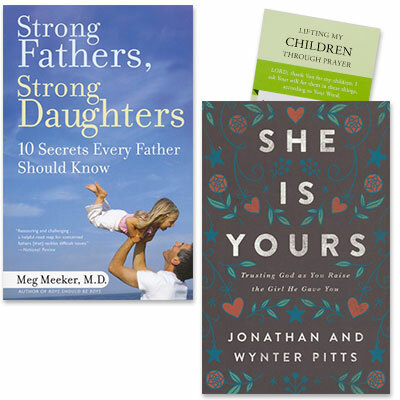 In this unique and invaluable guide, Dr. Meg Meeker, a pediatrician with more than twenty years' experience counseling girls, reveals that a young woman's relationship with her father is far more important than we've ever realized. To become a strong, confident woman, a daughter needs her father's attention, protection, courage, and wisdom. Dr. Meeker shares the ten secrets every father needs to know in order to strengthen or rebuild bonds with his daughter and shape her life–and his own–for the better.